Giving a lecture in a lecture hall, presentation in the office, or video conferences requires not only ultra-sharp image display, but also a clear sound. Many devices provided with anti-reflection effects and touch function deliver high-resolution images but not the desired and appropriate sound. Because of poor acoustics, such videos, lessons and conferences are “blurred” and not well-understandable. This can be remedied by so-called soundbars – small loudspeaker bars that ensure a clear and understandable sound. What is does a soundbar mean? A soundbar is a longitudinal loudspeaker unit that is sometimes called “sound projector”. The unit is mechanically and electrically connected to a touchscreenn and, thereby, replaces the loudspeaker unit integrated in the display screen. With various models from the JTouch, BigTouch and Mondopad series, the 50 watt HW-Soundbar-4 from InFocus of lets the listeners enjoy a clear and sharp sound . Unlike the JTouch and BigTouch models, the HW-Soundbar-4 is delivered together with large InFocus Mondopads (>55“ screen diagonal). 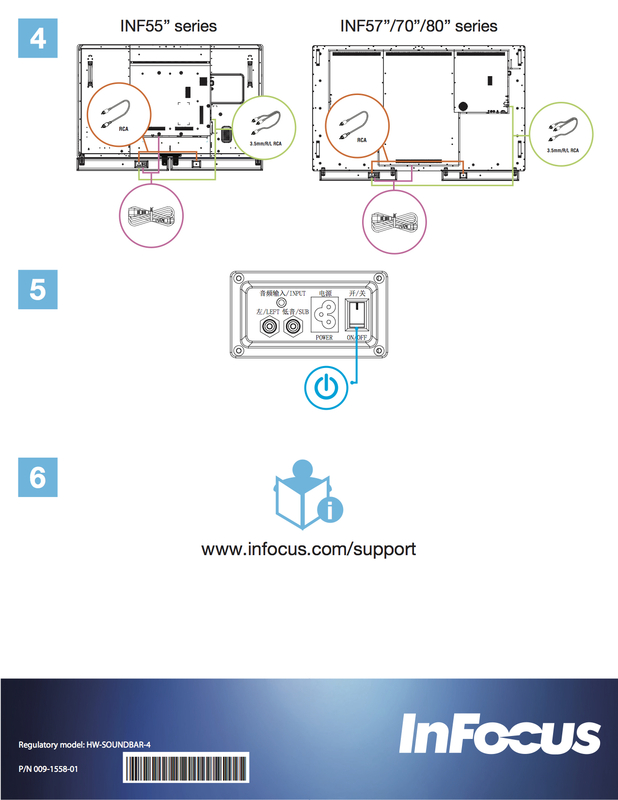 HW-Soundbar-4 is compatible with many devices from the series JTouch, BigTouch and Mondopad. By means of mounting units already available on the touchscreen, this small loadspeaker bar can be mounted on the bottom or on the lateral side of the display screen. 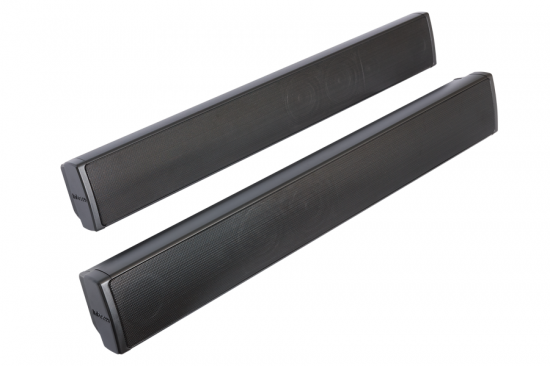 The scope of delivery contains a total of 2 soundbars for the left and right lateral side or bottom. A soundbar is 88,9 x 670,56 x 66,04 mm large and has two 3″ and one 3/4″ aluminium neodymium tweeter loudspeaker..
For a clear and intelligible sound in video conferencing, the soundbar provides 50-watt stereo and 70 Watt peek value for the entire system. The frequency range is from 90Hz to 20KHz. 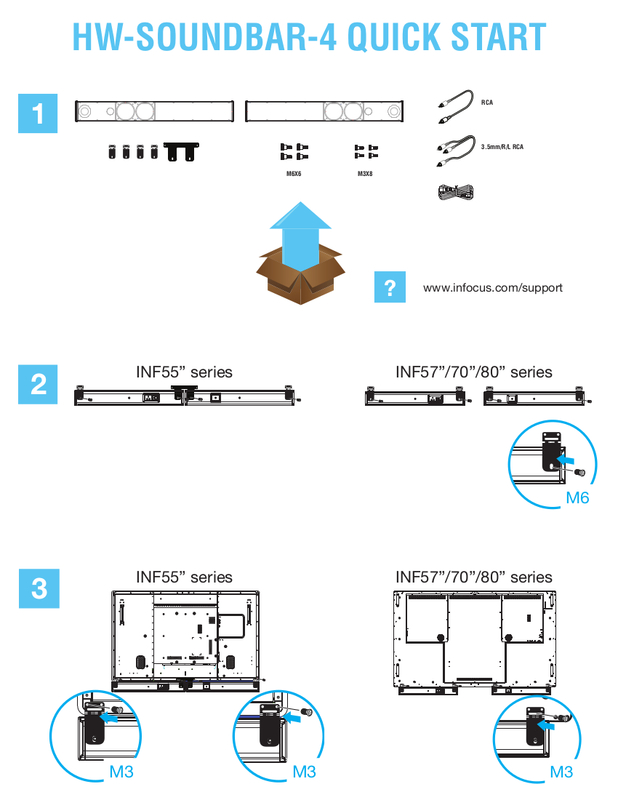 How to install the Soundbar? This entry was posted in Zubehör and tagged HW-Soundbar-4, Soundbar on 23. February 2018 by Nicola.